To begin the story of the CD32 we have to get down and dirty in the 1980’s and more specifically, the latter part of the 80’s. At that time Commodore were dominating the home computer hardware scene, especially in the UK and Europe, where the PC had yet to establish a firm foothold for the home user. This was in part due to the higher cost of the IBM compatible machines, but also because the tried and tested method of a rectangular shaped computer hooked up to the home television had been in place for a decade, starting with the affordable Sinclair ZX80 back in 1980 and surging forward like a digital juggernaut. The Commodore Amiga range, along with the Atari ST models seemed like a natural progression from 8-bit to 16-bit technology, and the superior capabilities of the Amiga helped it to quickly dominate this scene. However, before the 80’s were out, a new type of computing device started to take over television screens in homes across the land. This computing device was called a “Games Console”… What crazed witchcraft was this, you may ask? 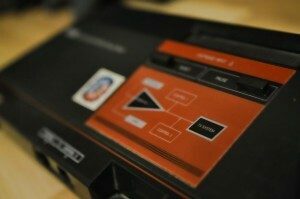 These sleek, shiny, keyboardless devices in the common guises of the Master System and NES, seemed to appear in homes overnight and their even lower cost of entry soon caused a rumble across playgrounds in every corner of Europe, and indeed the United States. Commodore recognised this, and only a few years later, with the onset of the Mega drive, the market quickly started to overlap directly on their home soil. Here was a machine capable of very similar graphics and sound to their beloved Amiga, but it was more accessible, cheaper and in a lot of senses, cooler (plus it had blast processing! whatever the hell that was). Commodore initally tried to enter the CD market with the CDTV; they failed. 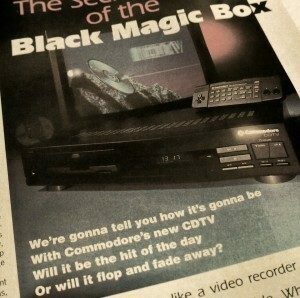 Commodore had initially tried to hit back with the CDTV, offering the latest in fangled Compact Disc technology, but unfortunately just not cutting the mustard, instead trying to fill a gap that didn’t exist. Indeed, the only gap it created was the £699 hole you’d have in your bank account if you decided to buy one. Even worse they took another stab at pushing the already outdated Commodore 64 hardware out as a console in the guise of the Commodore 64GS. And, although aimed at the lower end of the market, it was too far behind the curve to be a success. Commodore felt this wave and felt threatened, which soon put their cogs into motion on a higher and more determined level. The appearance of the SNES in the early 90’s further rubbed salt into the wound and clearly something had to be done. Something different and something better. Commodore’s first port of call was to launch the Amiga 600, which was aimed to directly compete with the 16-bit consoles, but it didn’t cut as much swave as had been hoped. The Amiga 1200 was an upper range computer, and appealed to a specific, niche, typically a niche that could afford the increased processing power and now wanted to show off to their friends who had, at the time, graphically underpowered, ill software served PCs. The cartridge based formats of the consoles was also offering more than disk based systems could offer. Let’s be honest spreading a game over several disks, or requiring a disk swap just to get to the title screen (I’m looking at you GODS) isn’t the most convenient. Combine this with the fact that piracy was rife on floppies and you can see why publishers were equally keen to switch. Clearly someone at Commodore was keen to push on with the CD format, which offered the best of both worlds, in that it was difficult to pirate, but cheap to produce. The advent of the Mega CD format helped to cement Commodore’s chosen direction. Soon out of the dwindling finances of the Commodore pot, in the summer of 1992 a rather hasty CD32 idea was born, and although it was designed to make sales as quickly as possible, it was also a good enough piece of kit to stand a chance. The ace up Commodore’s sleeve was the fact that they already had some pretty good technology in the shape of the new Amiga 1200’s AGA chipset. Simply by robbing this and whopping in a CD drive, Commodore cleverly realised that they could arrive in the home console market in style, which they specifically targeted this time, after learning the mistakes of their all in one CDTV attempt earlier – which was in a way ahead of it’s time, with consoles such as the Xbox one now neatly fitting that arena. So, arrive in style they did, with the first 32-bit based CD console available in Western Europe. In fact it was only beaten globally by the Japanese exclusive FM Towns, which possessed internal 32 bit architecture, but in fact, only possessed a 16 bit data bus. So, time was on their side, but it was also, rapidly starting to run out. When the CD32 hit the market, the only real competition the machine faced was Sega’s Mega CD. A machine with which the CD32 actually drew a lot of comparisons, with similar intro screens, a similar technical specification (the Mega CD being based on 2 16-bit 68000 processors as opposed to the 1 68020 processor in the 32) and similar marketing tactics. Both machines were aimed at the same area of the market, although Amiga were keen to point out the additional 16 bits afforded to the CD32, as well as the fact that it didn’t need an ageing donor 16 bit console to get it running. Like a patient being fitted with a pacemaker. The CD medium had now been out for a few years and this meant that publishers had been given a chance to get to grips with the technology and were able to produce software titles in quite a short space of time. Which was handy as Commodore had made the naive decision to keep the console under wraps for as long as possible, so that rivals didn’t try and pip them to the post. David Pleasance, Commodore’s general manager acknowledged this mistake during an interview in a special preview edition of Amiga Format – cleverly called Amiga CD Format -, and although Commodore launched in time for Christmas 1993, their software promises didn’t meet the available line up, which was somewhat of a disappointment for consumers and was almost certainly a factor in why the CD32 didn’t storm the market as well as it could have. In the interview David also talks of the misunderstanding which arose when Commodore told half the publisher’s there would be a new CD product and the other half that there would be an add-on device for the Amiga 1200; the intention was for producers to create software for the 1200, with the scope to enhance it for the CD format. What happened was the opposite, with many publishers creating CD based software and then attempting to scale it back to fit the 1200 later. This meant that the CD titles weren’t suited for the CD32 control schemes and that many titles weren’t available for the 1200 as early as they should have been. Price wise, the CD32 was aimed to undercut the Mega CD by quite a margin. 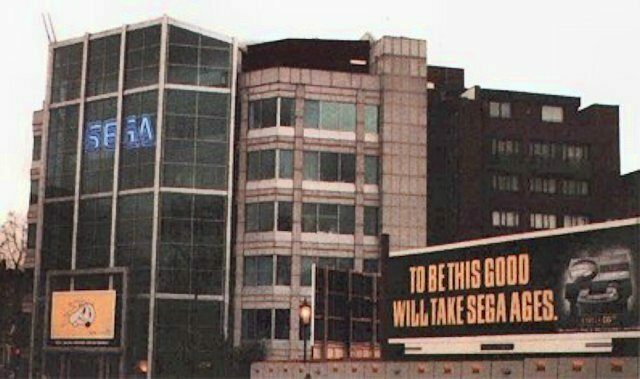 At the time Sega’s CD add on was retailing for £369, with the Mega Drive another £100 on top. 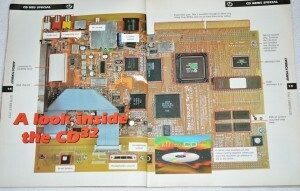 The CD32 was poised to enter the market at just £299, which was pretty darn competitive, although still fairly expensive for the general masses, and was well out of my budget at the time, even when I tried to compound several Christmases and Birthday presents together. 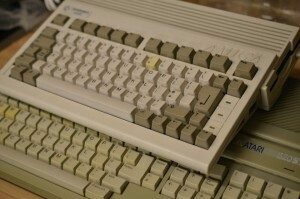 At the same time Commodore lowered the Amiga 1200 price to £299 as well, so that the CD32 wouldn’t compete for the same market share. When it came to the US market, there was never an intention to launch there as Commodore’s retail presence was deemed simply to small to make an impact. In fact David’s words were “It’s something that we completely laid down, kicked our legs in the air and let ourselves get raped on several years ago”… a blunt, if not accurate way of putting their impact on the important American market. Internally, the CD32 was almost identical to the Amiga 1200, which given the rush to get the hardware created, was expected. Although it didn’t feature a B52 quote printed on the motherboard; something that had been synonymous on older machines. Ultimately, this similarity with existing technology was a good move as it opened up the CD32 to a swave of software designed for the older Amiga models. Commodore also decided on adding libraries into the CD32 Workbench operating system, that enabled it to be compatible with most of the CDTV titles – another small win which may have won over the few consumers who had jumped onto that early – I won’t say band wagon – but, more wheeled bucket. Although the CD32 was essentially identical to a keyboardless and floppyless 1200, it did actually possess an additional chip named Akiko. 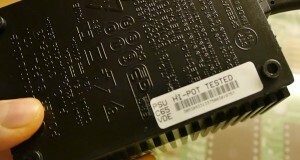 The Akiko chip was a gate array and combined multiple features of other Amiga chips into one package, however it also had an extended feature in that it was able to perform to “Chunky to Planar” conversions, which would ordinarily consume many cycles of the 68020 processor. It was requested by Amiga’s software group as most software was currently being developed in chunky pixel mode, suitable for PCs – this function converted these “Chunky Pixels” to Amiga bitplanes. So essentially, it allowed 3D based games to run faster, as if they were on an expanded A1200. It still ultimately, wasn’t enough to compete with machines such as the 3DO or Playstation, BUT it did give the CD32 the edge for the plethora of first person clones that were soon due to arrive on the scene. The unfortunate fact however is that most games were designed to run on the 1200 as smoothly as the CD32, so for most software, this extra chip didn’t really serve much purpose other than to conduct a bit of electrical current and toss it around the main board. Obviously the CD32 had a CD-ROM drive instead of a floppy, with the drive itself being a double speed 300kbit per second transfer jobby. The drives themselves were actually made by Sony (yes, the same Sony of Playstation fame), but the electronics and the microcode were jointly developed by Commodore and a Japanese camera manufacturer called Chinon. The drive operates on a custom interface, so isn’t compatible with IDE or SCSI, and for audio it acts as a full 16 bit 8x oversampling player. Of course the CD32 also possessed line outputs so that it could be hooked straight into your hi-fi; quite a novelty at the time, and definitely a selling point for those torn between buying a CD player or games console! However, One major issue of possessing a Read Only Memory drive is the distinct lack of save capability and indeed, Commodore shot themselves in the foot a little with this one. The CD32 did actually have some internal flash memory for save functionality, but at 1kb it was such a pitiful amount that hardly any software could utilise it. Most save games consumed far more than 1kb, so at most you could save your progress on one very simple game, which had to be overwritten each time. Ridiculous. The machine did however, house 2MB of RAM; the same as a 1200, which given that the mega CD only contained 128kb was a VAST amount. The on board processor was the Motorola EC68020, clocked at 14.32 MHz (NTSC) or 14.18 MHz (PAL) which possessed both internal and external 32 bit data address buses, making for a true 32 bit machine (whatever that really meant). Performance wise it was a reasonable step up from the 68000 found in the Amiga 500, 600 and also machines such as the Mega drive. You could probably compare the 68000 to a high end 286 machine and the 68020 to a high end 386. The machine was capable of dispalying a 24 bit colour palette of 16.8 million colours with up to 262,144 on screen in HAM-8 mode (with absolutely no colour clash!!). Resolutions were at a tidy 320×256 pixels, in line with TV standards. Audio was provided by 4x8bit PCM channels with a 28khz DMA sampling rate. In ROM resided Amiga’s Kickstart 3.1. The same as you’ll find in the Amiga 1200, just with CD-ROM support and the additional CDTV libraries I discussed earlier. Taking an external look at the machine, you may or may not notice depending on the openness and focus of your eyes, that the machine has a handy S-Video socket for much improved picture quality when compared with the standard RF connection which was commonplace in the day. The system also featured a serial port for connection of a keyboard, A/V jacks for stereo output, controller ports which would happily accept mouse so that games such as cannon fodder were still playable, and indeed actually incorporated some plug and play technology whereby the system would sense the controller type connected and do pointer conversions, so that a joystick could be used as a mouse and vice versa. The most appealing connector of all, was a full edge expansion socket located under a flap at the rear of the unit. This expansion socket allowed the attachment of the MPEG FMV module to allow full playing of video CDs, and even compatibility with some Phillips CDi videos. Although this format didn’t really take off at the time, I remember the excitement of being able to play full length films through a games console! It was crazy, crazy stuff. Looking back it’s pretty difficult to see what all the fuss was about, but then MPEGs did take us forward to the current video formats we have on computer today (Hello Youtube!). The expansion socket also allowed for an interface to fully expand the CD32 to a full Amiga 1200, with interfaces for floppy drives, parallel printer port and hard drive capability. The control pads are a notorious point of contention, with their radical, upside-down look causing absolute fury with some people, and others accepting and even liking the new design. I for one am in the latter group, and even though D-Pad is a little on the wobbly, cheap side and prone to breaking after prolonged use. I don’t care. It’s just another feature that sets the machine apart. The pad features numerous buttons, with the main button labelled “123”, presumably because it acted as all three fire buttons for most previous Amiga titles which were limited to single button joystick controls. If you weren’t happy with the controller you could always buy yourself a grey, clearly mega drive adapted, competition pro pad, which is nice enough, feeling rugged and purposeful in the hand. Other buttons on the pad are clearly labelled up for CD player control with the standard skip, play, stop and pause icons clearly visible in an embossed style. Power was supplied to the grey beast through a 4 din plug, with the supply itself being lower powered than a typical Amiga box, so unable to sustain a large number of peripherals. In fact if you look carefully on the bottom of the supply you’ll notice the label stating C65. These power packs were in fact the original supplies destined for the ill fated Commodore 65 line, which was due to replace the Commodore 64, but never made it past the working prototype stage. Much to my sadness and intrigue. God I wish I could get my hands on one now though. Anyone got a spare one? Please? Anyone?? The CD32 launched in September 1993 with promises galore about the software that could be expected before, YES BEFORE, Christmas. The console had limited appeal in the states as predicted by Commodore but received a warm reception in Europe, notably in the usual areas of the UK and Germany, helped massively by being the first 32 bit CD based console in these areas. This was huge at the time, absolutely huge! I remember the excitement surrounding it clearly – 32 bits was the console equivalent of a Porsche with all the optional extras (not including floppy drive or save game feature). 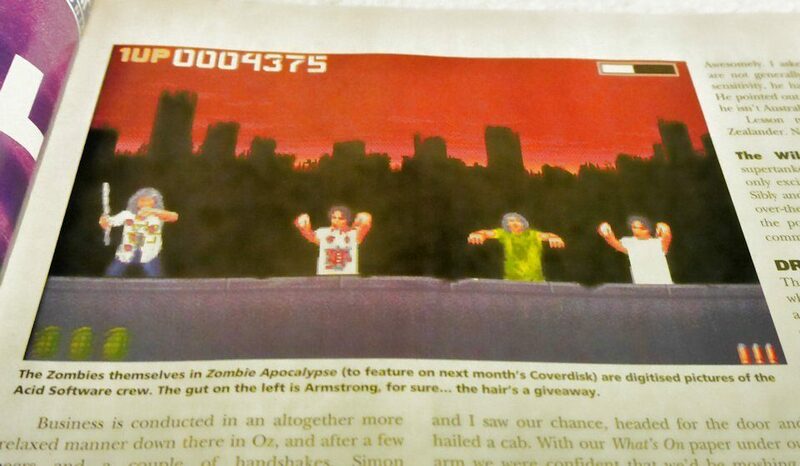 The celebrity chosen to endorse the console in the UK was the “popular at the time”, Chris Evans…… errrr, wahoo! 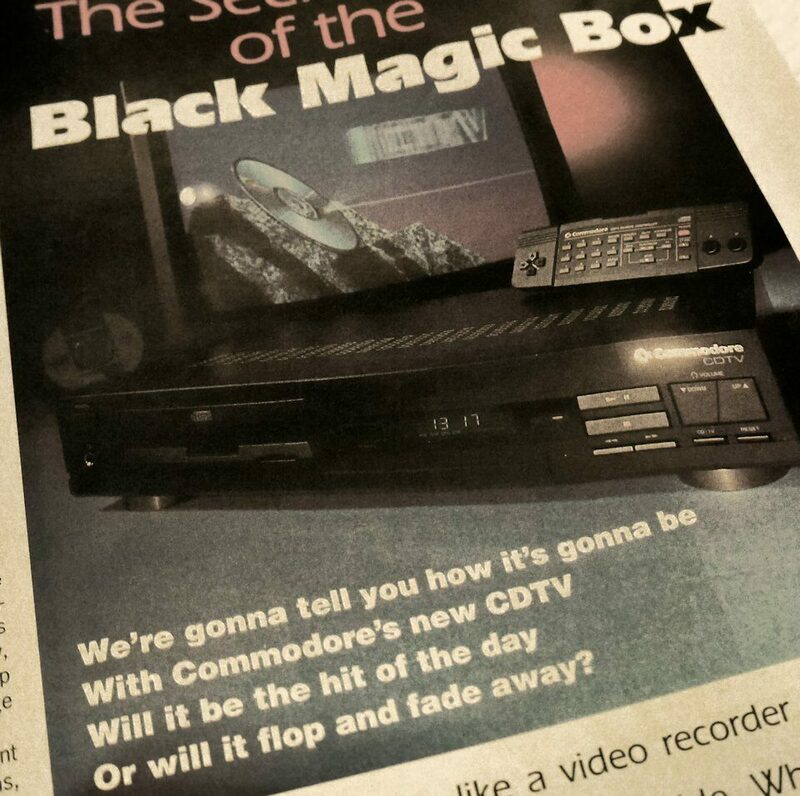 Well played Commodore, well played. Better played, was Commodore erecting a huge billboard outside Sega’s UK headquaters with the slogan “To be this good would take Sega ages”… not a bad attempt I must say… Well played Commodore, well played. 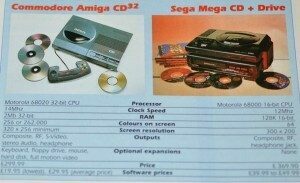 David Pleasance continued to remind consumers of the pros offered by the stand alone CD32 over the cumbersome, outdated and modular Mega CD/Mega Drive combination. Unfortunately component supply problems left Commodore short on meeting targets, and even though the console sold over 100,000 units in Europe alone, little did he know (although, let’s be honest, he probably did) that round the corner lay a few problems in the shape of the Playstation and Sega saturn which were only a year from release. That’s not including the, *ahem* 32X either, to further frankenise (is that a word), the already abused Mega Drive. Arrrrrrrrgghhhhh! As with every other platform every released, software is crucial to it’s success, and in this respect, it could be viewed that the CD32 had great fortune, with it’s technical ability to run most of the huge Amiga back-catalogue. However, in reality, gamers wanted more. They wanted to see the full potential of the CD format, they wanted to experience the new controls and they wanted a machine that was ultimately better than their mates’. That 32 bit badge had to mean something, so developers had a lot of work on their hands to meet the expectations, and sadly most didn’t meet the challenge. 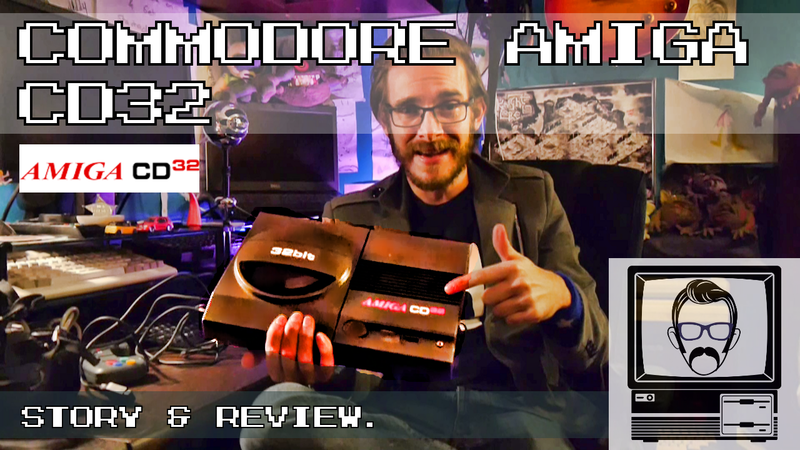 Although the CD32 had a great head start with existing Amiga software, it wasn’t enough for the new format. From Bullfrog; Magic Carpet, with it’s “at the time” incredible graphics. The already popular Syndicate and the trend setting, Theme Park. Gremlin graphics had a CD32 version of Zool at the ready, but it was a straight port of the 1200 version, just with a pre-rendered CD-ROM intro to try and woo audiences. Many software houses were promising “Cartoon quality graphics”, which sounded amazing, with games such as Oscar and Surf Ninjas attempting to bridge the gap. Microprose were keen to attempt an AGA conversion of Civilization for the CD32, but the problem with lack of save game functionality played a huge problem. This wasn’t the only title that gamer’s lost out on because of this shortfall, with a disk drive expansion far off, it was frustrating times. Many games relied on a password system, but seriously, Civilization with a password save system? Please. As Bad Influence had earlier reported, James Pond 3 was also getting ready for the machine, and although it featured extras over the other formats, these really weren’t the extras that most CD console owner’s were hoping for. Sure there were additional levels, extra sounds, better music, but the hope – and this is certainly true in my book – was for something much more impressive and much more incredible. The appetisers being served just weren’t cutting the mustard in this way. The new titles were certainly better than the early CDTV titles, but they needed more oooomph! Things would get better with the onslaught of first person perspective games due around the corner, such as Alien Breed 3D and Gloom. But these were unfortunately weren’t quite enough and far too late to help the machine, and ultimately, revive Commodore’s fortunes. One golden egg that the CD32 had of course was the increased storage capacity, and although this allowed lengthy and ultimately pointless cut scenes, it also made compilations such as the Lotus Turbo Trilogy viable. All three Lotus games on one piece of storage medium? Now we’re talking! 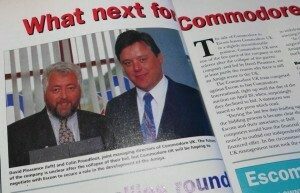 Here we see David Pleasance, Commodore’s general manager, sealing with the deal with MD Colin Proudfoot. Sadly Commodore International filed for bankruptcy in April 1994, causing the CD32 to be cut short only months after it’s launch. The name was initially bought by German company, Escom who relaunched the Amiga under the brand, Amiga Technologies GmbH. They continued to sell the Amiga 1200 with it’s Magic Pack, which initially sold well. This was followed by the sale of existing Amiga 4000 stock. However the CD32 was no more, clearly with Escom realising that it’s technology had lived it’s short, purposeful and bright life. Thankfully, the CD32 had sold well enough initially for publishers to continue making and selling software for the reasonably niche market for a number of months after it’s demise. But as with all these things, when the writing is on the cards, there’s little you can do to change it. I never owned the CD32 myself – until recently that is – but I did own an Amiga 600, which I adored. And my huge appreciation of that machine, combined with my excitement for the CD and 32 bit technology at the time, made me want one badly. It’s a shame I had to wait 20 odd years. But like they say, good things come to those who wait….